VINCEK. Marion (Kallen) Vincek, 88, of Windsor, beloved wife of the late Edward Vincek passed away Monday, November 14, 2016 at home surrounded by her loving family. Born September 9, 1928 in Hartford, daughter of the late Alfred and Sophie (Strogoff) Kallen she lived in Poquonock section of Windsor all her life. 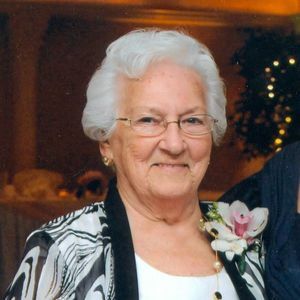 Marion graduated from John Fitch High School with the Class of 1946, she was past president of St. Casimir's Lithuanian Women's Auxiliary, and participated in bowling leagues. She was a communicant of St. Joseph Church. She is survived by her two daughters, Sandra Hedderman and her husband, Robert of Windsor Locks, Janice Mattarazzo and her husband, Richard of Windsor Locks; two grandchildren, Scott Koprek and Amy Santere; a great grandchild, Joseph Koprek and a great grandchild due in December. She was predeceased by a brother, Edward Kallen. Her family will receive friends Thursday, November 17, 2016 from 4-7 PM at Carmon Poquonock Funeral Home, 1816 Poquonock Ave. (Rt. 75), Poquonock section of Windsor. Family and friends may gather Friday, November 18, 2016, 9:15 AM at Carmon Poquonck Funeral Home followed by a Mass of Christian Burial, 10:00 AM, at St. Joseph Church, Poquonock. Burial will be in St. Joseph Cemetery, Poquonock. In lieu of flowers donations may be made to a charity of the donors' choice. It was with sadness that we read Marion's obituary. She was a beautiful, warm and generous woman. We have fond memories of her and Ed. Our condolences to you all. My sincere condolences to you both and your families on the passing away of your mother. She was such a beautiful women. To Marion's family. I was shocked to see her name in the obituary column. She was a nice person whom I had the pleasure of knowing for many years from St. Casimir's. She will be missed. Sending my sympathy to all. May God bless her and shed his blessings on her family. Lorraine Roussel.